You know how it feels when your skin starts crawling a little and you begin wondering if maybe you sat down in chiggers? That’s how the silver and GOLD PRICE leave me feeling today. Both shot into new high territory for the move ($17.17 and $1,204.70), then both closed Comex lower. That’s sort of a key reversal’s first half, but silver messed up by closing up 3 cents on the End of Day Chart. Point is, neither was able to hold on at higher prices. That’s weakness that only emphasizes they are both trending down. Both daily prices look very strange. Flat, with a sudden rise and peak between 11:00 and 2:00, followed by a return to flatlining. NGM fingerprints? Nothing has changed. Either silver and gold prices will hit those upper triangle boundary lines near here ($16.50 and $1,170) and turn around, or they will sink all the way to the bottom boundary or lower. ($1,150 and $16.00) or lower. Right now neither buyers nor sellers have an edge in th`is fragile balance, but in this hard and rocky world, fragility don’t last long. I don’t get too excited at my age. I might start to jerkin and twitchin’ and fall out of my chair. But, O Heavens! I have seen something, some courage, I had almost given up hope of seeing. 1. No talk of doom, gloom, and world’s end, only a plan for building the future. 2. A guard against confiscation. Think that won’t do any good? Think again. It’s Texas. If anybody would stand up to the Feds, it’s Texas. 3. Payment Provision. Account holders can pay other account holders, gold, silver, platinum, palladium, or rhodium. 4. Check writing. Yes, you can write a check against your account to pay metals or, I believe, the yankee dollar equivalent. 5. A statewide network of depository agents in every dusty hamlet. 6. NO HYPOTHECATION. No derivatives, no futures, no delayed delivery, none of that hocus-pocus New York and London feed off of. Hard metal in hand. 7. Official exchange rates. Requires comptroller to publish official exchange rates for precious metals transactions into yankee dollars and other currencies, but not “setting” an official rate. 8. In sum, this bill establishes a state-wide gold and silver bank for payments and storage. This is the very best sound money bill I’ve seen so far, far better than those pitty-pat Utah-type solutions that say silver and gold coin are legal tender when the constitution and US statutes already provide that but everybody’s & every state’s too chicken to enforce it. Since at least 1991 I have firmly believe that whenever an electronic gold and silver payments system could be established, it could supplant fiat currencies worldwide in two years at most, less time given a crisis. Everywhere it has been tried, the US government has fought it bloody tooth and nail, nationally and internationally, and sought to stop it by criminal prosecutions and regulations. Now Texas steps forward to make it stick. And if Texas has nerve to carry through, it could make Texas a center of world finance to rival New York and London — Better than Switzerland because it is home to 27,695,284 Texans and all but two of ’em are armed and serious. The bill has passed the house and senate, and the senate has sent it back to the house with a few amendments. If you live in Texas, go to http://www.legis.state.tx.us/Home.aspx and find out who your representative is and send him an email NOW urging him to vote for this bill. And SHAME on you if you won’t. LO! Look upon the Dow Jones Composite, and be instructed! The Composite combines the Dow Jones Industrials, the Transports, and the Utilities averages. And guess what? 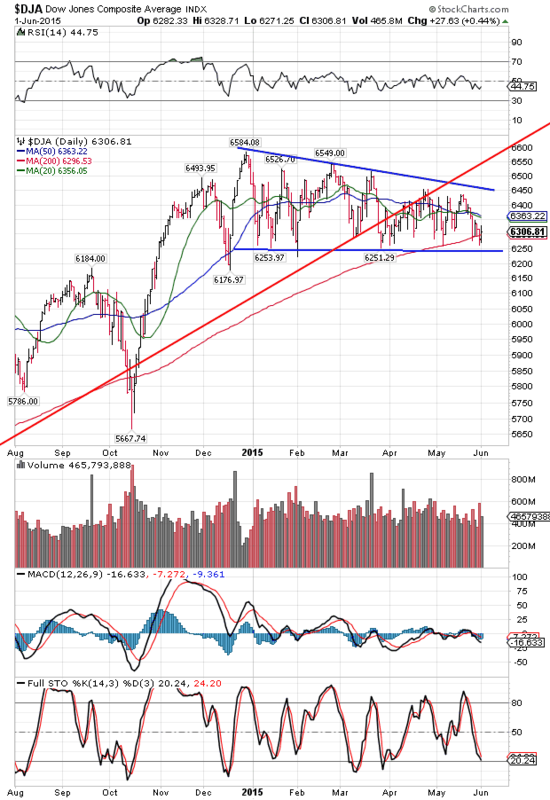 Friday it closed below the 200 DMA, and nearly below its lower support. Today it might close above the 200 DMA again, but all indicators point further down. Look at the chart on the right. Today the Dow rose 29.69 (0.16%) to 18,040.37, enough to climb above its 50 DMA, but not much else. S&P500 climbed 4.35 (0.21%), not quite enough to close above its 20 DMA. Momentum for stocks is down. US dollar index shot up 49 basis points (0.5%) to 97.47. It has bounced up off its 50 DMA, and it if exceeds the last intraday high, 97.88, it will travel higher. Momentum is up, and the Europeans’ fecklessness in fixing Greece’s problems just festeres on. No leadership, no direction, just politicians frittering on until they can figure out some way to bail out the big banks who hold the Greek debt at the taxpayers’ expense. A disgusting clot of lizards, snakes, and slugs. Euro lost 0.57% to $1.0926. Yen fell another 0.54 to 80.12 c/Y100 (or 124.8 yen to the dollar). Makes me feel slimy all over just writing about nasty fiat currencies. One interesting artifact appeared today: US treasury yields shot up. 10 year T-note yield rose 4.63% to 2.192% and is back north of the 200 DMA. 30 year bond yield jumped 3.65% to 2.951%. This was more guessing about the Fed raising rates. Hogwash.